Cataract surgery is the most frequently performed medical procedure in the United States with millions of cataracts removed annually. The Hurst / Fort Worth cataract surgeons at Texas Eye and Laser Center have performed thousands of successful cataract removal procedures using the most advanced technology available in the comfort of their own surgery center. This helps ensure the best possible results with maximum patient convenience. If you are experiencing any of the following symptoms, you may be a candidate for cataract surgery. How Can I Get Diagnosed with a Cataract? It is important to undergo an extensive eye exam by your personal eye doctor to determine if you are suffering from cataracts. If you believe you are experiencing the symptoms of a cataract, then please contact the Texas Eye and Laser Center in Fort Worth to schedule a comprehensive eye examination. Are you searching for a cataract surgeon in the Ft. Worth Area? A cataract is the clouding of the eye’s natural crystalline lens. The lens assists with focusing light rays on to the retina, which translates the image to the brain. After the lens starts to cloud, it is impossible to return the lens to its clear state with medications. Cataract surgery will be required. Some people think a cataract is a growth on the outside of the eye, but a cataract is actually the gradual clouding occurring within the lens located inside your eye. Various factors may increase the onset of a cataract, but it is said that if we live long enough, everyone will develop a cataract sooner or later. UV radiation and cigarette smoking have been listed as potentially likely to increase the development of a cataract. It is important that you discuss your vision expectations with your doctor so that you can determine the right lens implant for you. You will be given the choice of receiving a traditional implant, which corrects vision at one distance, or a LifeStyle Lens IOL designed to provide a wide range of focus. Your cataract surgeon at the Texas Eye and Laser Center will explain the differences between these lenses, which are outlined on our LifeStyle Implants Page. Whichever lens you choose will be inserted into your eye after your natural lens has been removed. Before the surgery, your eye must be cleaned and dilated. Both our Hurst and Fort Worth Cataract surgeons use topical anesthetic on the eye before the small incision is made. An ultrasonic device will be used to emulsify the hard yellow proteins that form the cataract. A suction device can then remove the liquefied cataract from the eye. A folded intraocular lens will be inserted through the original incision. This lens will stay in its proper and permanent position inside your eye. You will not be able to feel or sense this lens in any way. Your small incision will self-seal, and you will not require any stitches. Recovering from cataract surgery is fast and relatively easy. Most patients will notice better vision with their new intraocular lens implant within the first 48 hours. Please remember that no two eyes heal quite the same way, and sometimes vision recovery can vary. It is important that you follow postoperative instructions and use the two different eye medications (both eye drops) as instructed. It is important that you refrain from strenuous physical activity and from rubbing your eyes during the first few weeks after surgery. At Texas Eye and Laser Center, Dr. Brian Ranelle and Dr. Jerry Hu use a variety of advanced technologies that can enhance the quality of your vision after your cataract procedure, and even reduce the chances of you needing eyeglasses. One of these innovative options is SmartVision, a proven state-of-the-art analysis that provides your surgeon with an unprecedented new level of valuable information about your eye. And it’s on-demand during the procedure, which is exactly when it is needed the most. When SmartVision is included as part of your procedure, you can have the confidence of knowing that your surgeon has the information needed to optimize your visual outcomes. Over the past decade, laser-assisted cataract surgery in Texas has gained popularity among eye surgeons and patients with cataracts. While the traditional cataract surgery remains an effective option, a newer technique with the utilization of femtosecond laser has significantly improved precision and accuracy. We hold a standard of being ahead of the curve in the use of laser technology to perform cataract surgery. Texas Eye and Laser Center was one of the first surgical facilities in the United States to offer laser cataract surgery using the Alcon LenSx® Femtosecond Laser, and the Metroplex’s first blade-free, laser assisted custom cataract surgery was performed at our location in Fort Worth, Texas. 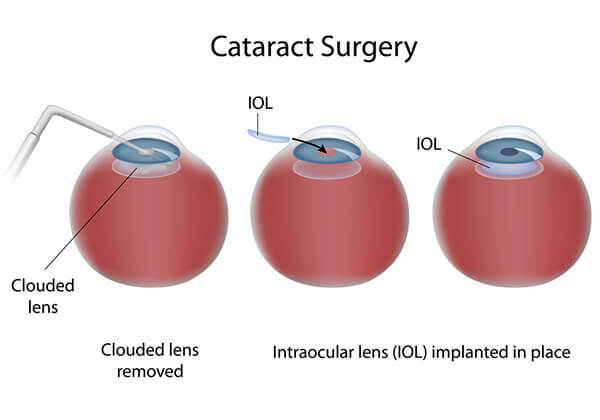 With laser-assisted cataract surgery, the laser is able to break the cataract into smaller and softer fragments. The incision is not burned easily because heat buildup is not excessive. Generally, the lesser the manipulation in the eye, the lesser the chance of breaking the capsule that will hold the implant. Also, the risk for swelling and inflammation is greatly reduced. Due to less manipulation in the eye, loss of endothelial cells during the operation is kept minimal, in fact, in many laser cataract procedures there is no loss of endothelial cells. These cells are strong indicator of the health of the eye as well as the clarity of the cornea, and the cells do not restore. Femtosecond lasers are equipped with the capacity to deliver infrared light that subsequently “breaks up” the cataract, at which point the surgeon will remove the fragmentation using a vacuum. This process can reduce the need for ultrasound during the procedure, which can cause collateral damage in and around the eye. The combination of less ultrasound energy use and fewer movements made within the eye work together to reduce the margin of error for the procedure. Before our ophthalmologists at Texas Eye and Laser performs laser assisted cataract surgery, every eye is mapped and measured, as no two procedures should be treated exactly the same. The LensX lasers used in our Hurst and Fort Worth clinics allow us to capture high-resolution imagery of the eye, which are used both in the planning and execution of the laser cataract procedure. The result is an individualized surgery with a degree of customization that was once inconceivable. If you have any questions before or after your cataract surgery, please contact our Hurst or Fort Worth cataract treatment centers. Your vision is important to us so don’t hesitate.